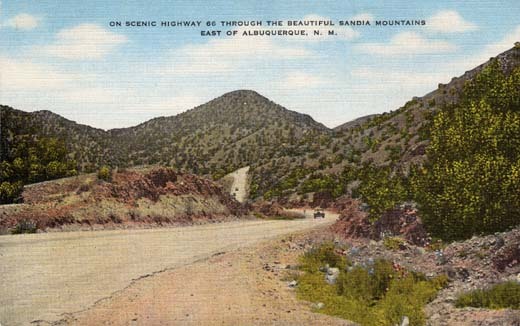 On Scenic Highway 66 Through the Beautiful Sandia Mountains East of Albuquerque, N. M.
Here is seen a breath-taking panorama as U. S. Highway 66 winds through the picturesque Sandia Mountains towards the City of Albuquerque. Approaching the city thru Tijeras Canyon is a thrilling sight as this scenic highway emerges from the base of the Sandias to the beautiful vista of the Rio Grande Valley. 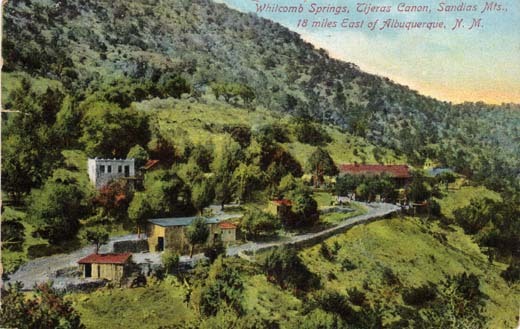 “From the Land of Enchantment”; Natural Color Post Card Made in U.S.A.
Whitcomb Springs, Tijeras Canon, Sandias Mts., 18 miles East of Albuquerque, N. M.
E. J. Strong, Albuquerque, N. M.
message; partial one (?) cent stamp, “Made in Germany”; PNC Co. 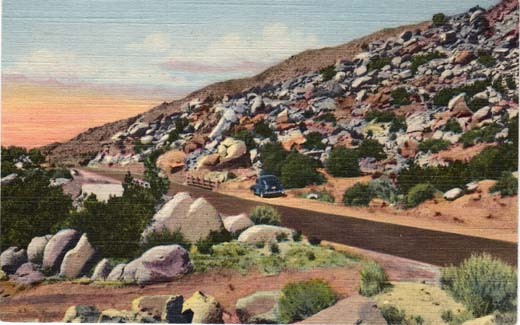 Scene in Tijeras Canyon, Highway 66, East of Albuquerque, N. M. This “City of Rocks” is traversed on Highway 66 in Tijeras Canyon of the Sandia Mountains about near the west entrance of the Canyon. Highway U. S. 66 Through Sandia Mountains, East of Albuquerque, N. M.
The highway winds through the scenic Sandia (Watermelon) Mountains towards the city which nestles in the foothills just beyond the peaks in the background. Picturesque little Spanish villages dot the landscape at frequent intervals, adding interest to the scene. Cedro Canyon, Cibola National Forest, South of Highway 66, East of Albuquerque, N. M. This scenic spot, about a mile south of Sandia Loop Drive Junction on the Highway 66, is in Cedro Canyon of the Cibola National Forest leading to Mountainair, N. Mex. 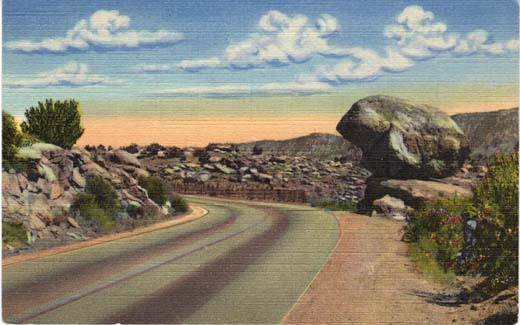 Balanced Rock on Highway U. S. 66 entering Tijeras Canyon, East of Albuquerque, N. M. This well known landmark comes into view, shortly after entering Tijeras Canyon of the Sandia Mountains, eastbound out of the city for Santa Rosa, Tucumcari and West Texas points. 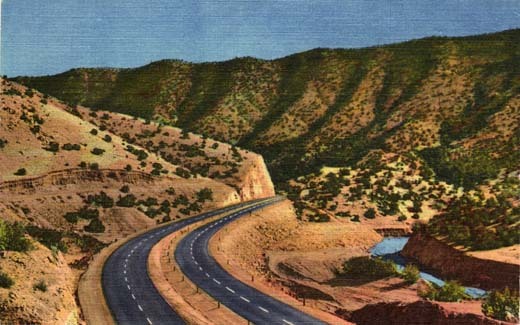 U.S.66 Four Lane Highway Through Tijeras Canyon East of Albuquerque, New Mexico. 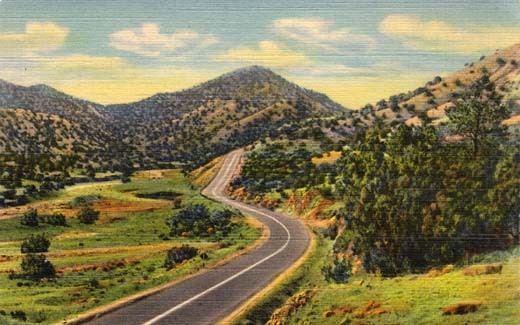 This modern four lane road winds its way gradually over the Sandia (Watermelon) Mountains through picturesque Tijeras Canyon. The Sandia Mts. 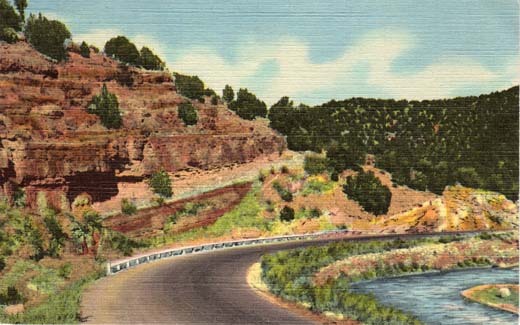 and scenic Tijeras Canyon are located about 15 miles east of the City of Albuquerque.